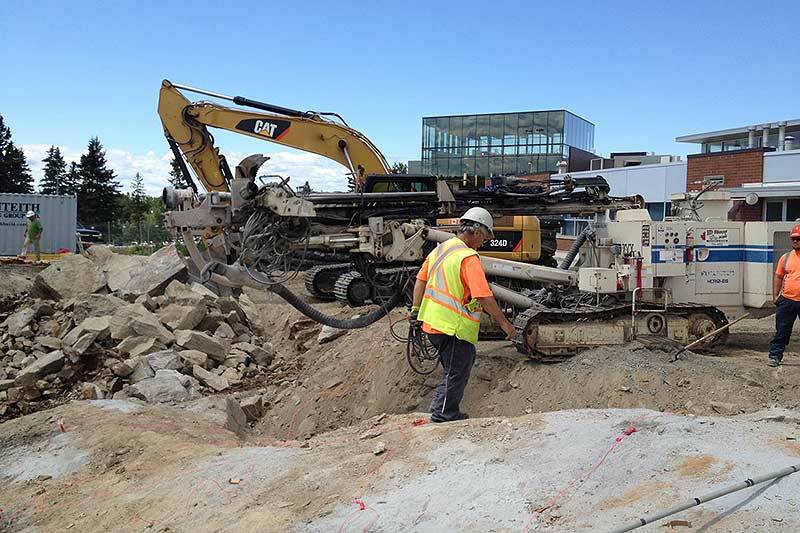 We provide drilling and blasting services by controlled use of explosives to break/remove rock to an accurate grade for building foundations, road grades, parking areas, and more. We also offer trench blasting for utilities and mass blasting for open pit mines and quarries. Our operators work in a safe manner and are capable of blasting near buildings and utilities while controlling and recording seismic activities. We can drill anywhere from 1” to 4” for different applications such as rock anchors, fence posts, and more. 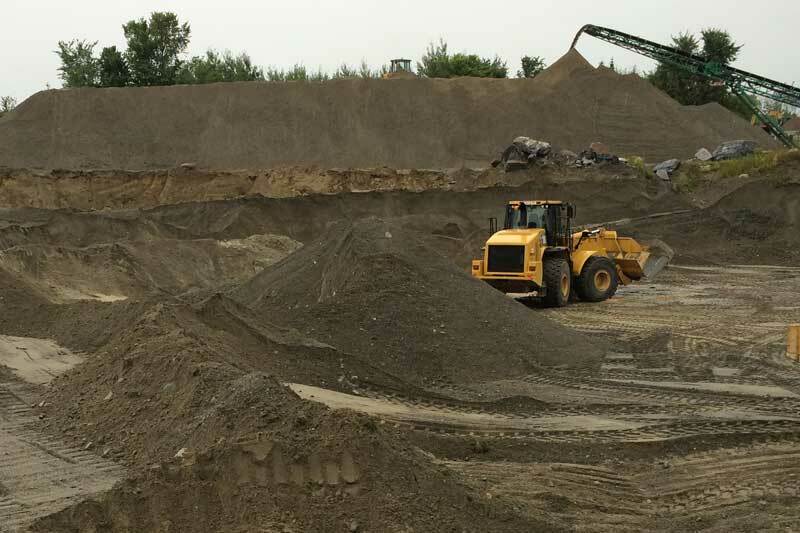 We currently manufacture over 15 different types of construction aggregate materials ranging from fine sands to coarse granular, as well as clean top soil. All our materials are subject to quality control tests to insure you are receiving the highest quality product that meets provincial specifications. With our state of the art portable crushing and screening equipment, we can quickly and efficiently mobilize at your site to process your material – saving you time and money. Our bulk sampling service provides mineral-processing testing of your potential ore body. 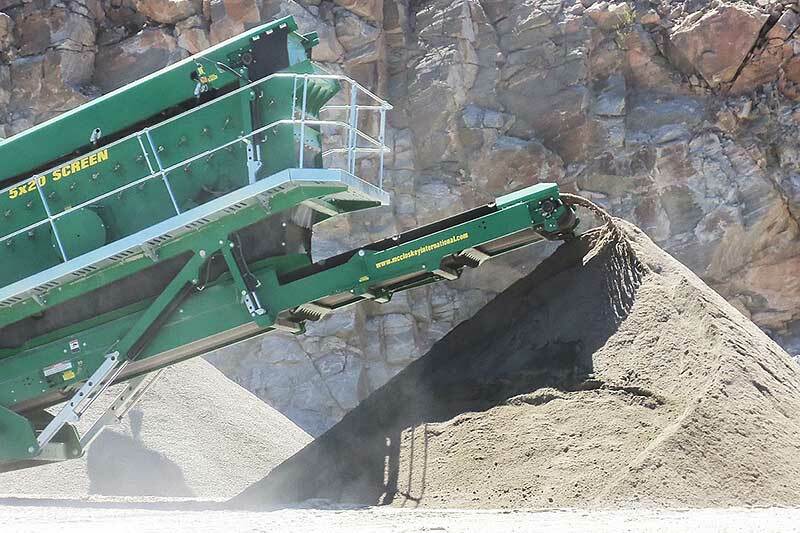 We’re well equipped with our portable crushing spread – complete with a sampling tower and conveyor belts. Our system allows us to set up and start the bulk sampling process on the same day. Our staff and on-site workers are trained and experienced to assure accuracy throughout the sampling process. We are experts in road construction. No matter the challenge, we will construct a well-graded and solid roadway. We can design and build your roadway or build from a pre-determined design. Our advantage is that we produce our own aggregates to achieve the required grades, and utilizing the cut and fill method to lower costs for our clients. We install sewer and water mains, services, concrete infrastructures, sub-drains, culverts, ditches, and more. 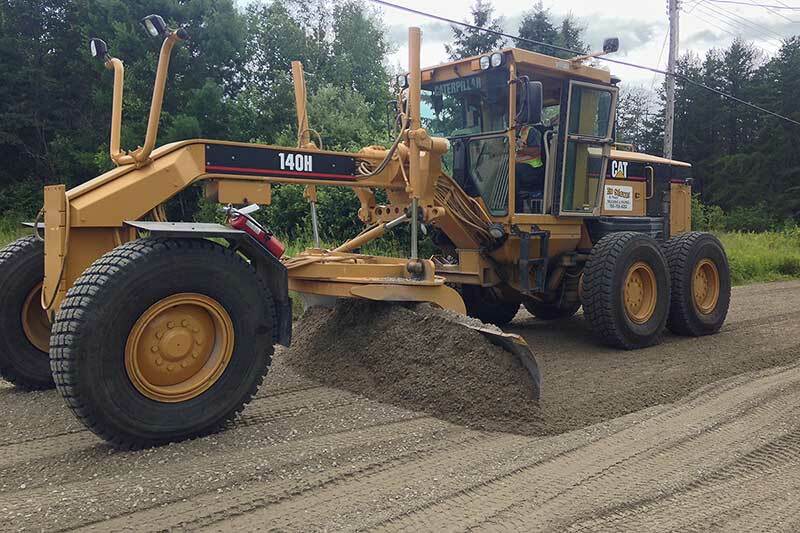 Whether it’s to maintain or rehabilitate roads, build a driveway, parking lot, wilderness roads, winter roads or municipal roads, Ed Seguin & Sons is your key contractor to construct a quality and cost efficient road that’s built to last! Our water truck is well equipped with a large reservoir tank and multiple portable pumps and hoses capable of filling up at any water course saving on travelling time. It can be utilized for dust suppression and to moisten the granular aggregates to obtain desired compaction results on roadways and job sites. The fire fighter style hoses and nozzle allows to control the trajectory of water to specific areas or to create a water fog. With more than 50 years experience, we know paving. We install asphalt for driveways, parking lots, roads, and also provide custom hand or machine work. Our estimates include sub-soil investigations in order to provide a granular-base recommendation with optional pricing. Our services include application for your locates, excavation and removal of any unwanted soils, supply, install and compact a solid base foundation, and install hot mix asphalt. We’re also experts in gravel and grading which is key for properly directing water and insuring a beautiful long lasting driveway. Concrete is utilized in the construction industry for various applications, from foundations to walls to cosmetic applications. 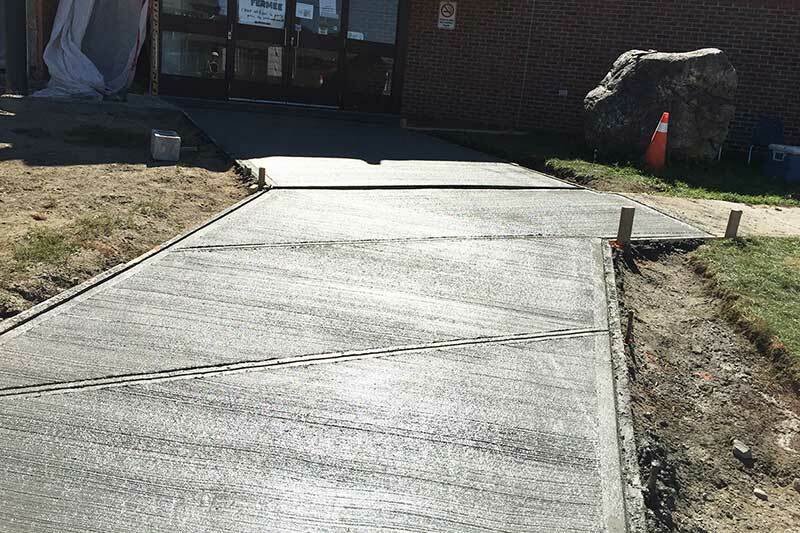 We provide services to both residential and commercial sectors which include concrete structural pads, sidewalks and curbs. We are able to provide cost efficient products because we have the equipment and experience to effectively excavate to native soil, supply, deliver and install the required base foundation, install the right frost protection, form and install the concrete with the right grade and finish. We have an extensive fleet of tri-axle, tandem and transport trucks to deliver materials and equipment. Our various transport floats include low beds and flat beds with special permitting capable of transporting wide, oversized and overweight loads. Various configurations allow us to transport heavier loads during the restricted load season when the spring break up occurs. We also have live bottom and belly dump trailers to transport aggregates in bulk and water trucks to suppress dust and provide on-site water solutions for compaction. Water and sewer services are a necessity in our everyday lives. While the city collects the water and treats the sewage, we install the distribution pipes and infrastructure to deliver fresh water to you and send sewage to the treatment plants. 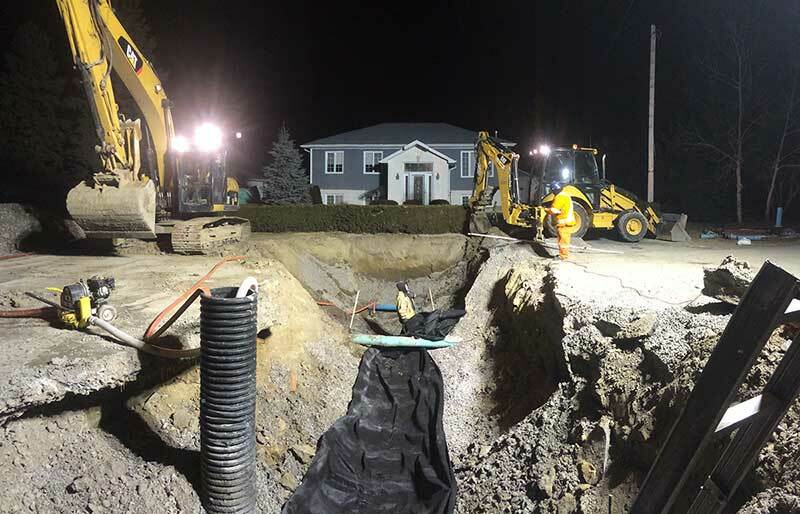 We safely excavate the roads to repair, replace and install underground pressure or gravity pipes, valves, catch basins and man holes. 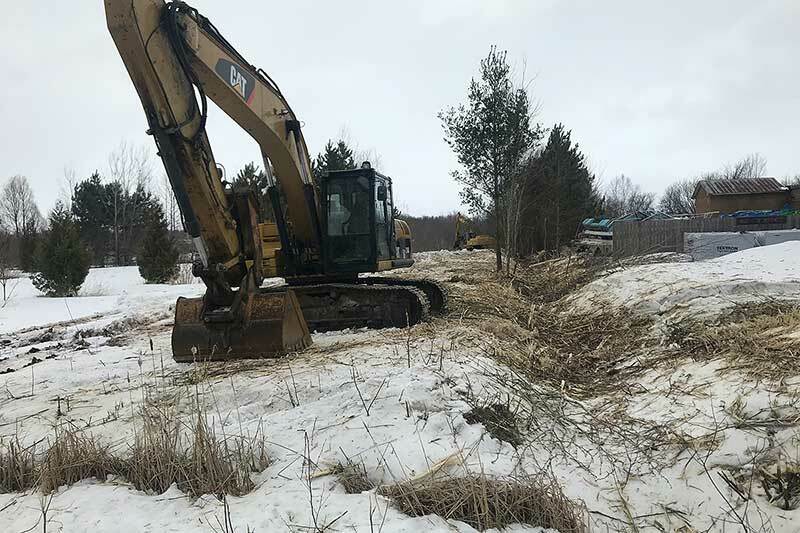 When building a new home, we excavate to the main lines, connect to them and bring the services to your building. We take drainage seriously and have learned to master it. 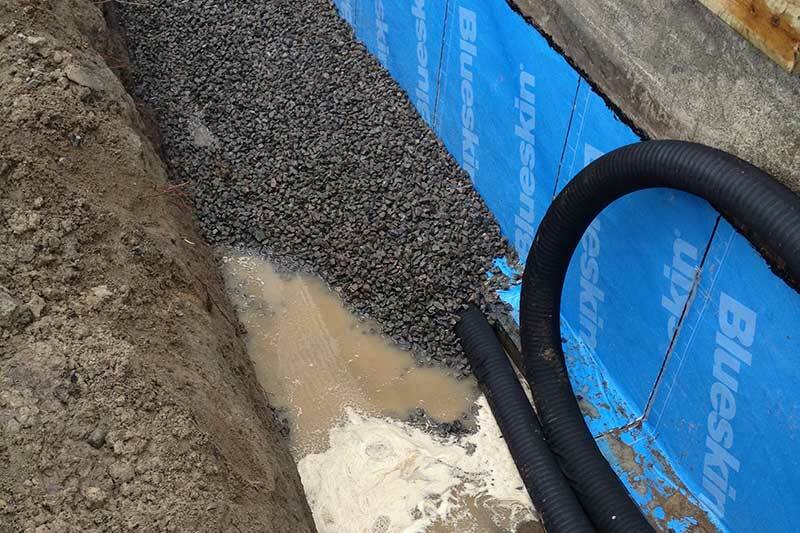 Improper drainage can lead to flooding resulting in infrastructure failure, foundation failures and crop losses. We provide drainage services including open ditching, underground piping, collection points, control points, pumps and ponds. 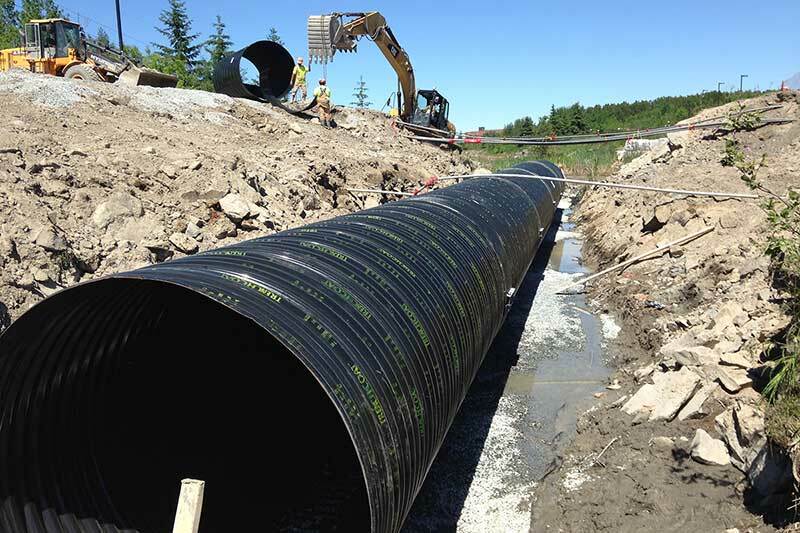 We supply, install and maintain drains, culverts, pumps and underground storm piping system. 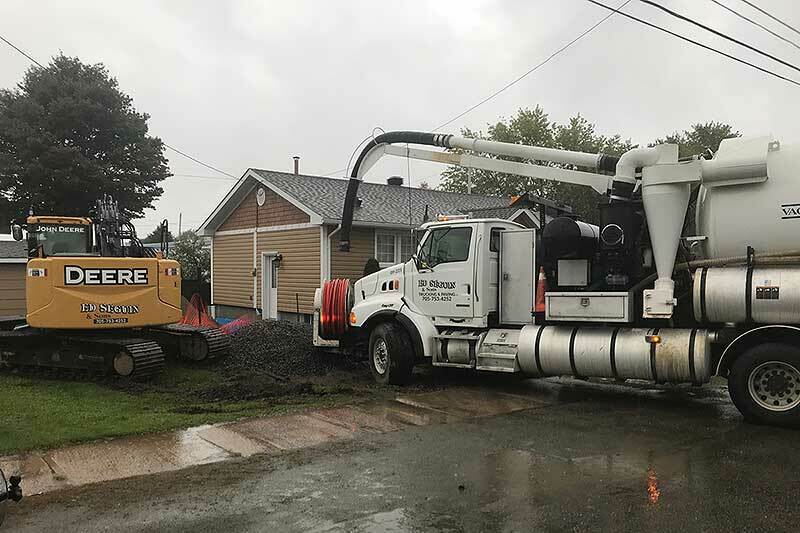 Hydro-excavation is the safest method of excavation when locating underground services such as gas lines, hydro lines, fiber optic, and more. It effectively breaks up the ground with pressurized water while sucking up the loose material with the truck. Our hydrovac service also cleans underground pipes, man holes and catch basins. We provide a full range of services required to maintain the surface of a mine site, including road and parking lot maintenance, grading, surface ore or waste handling/processing, material handling, equipment handling, pond maintenance and control, drainage, and more. 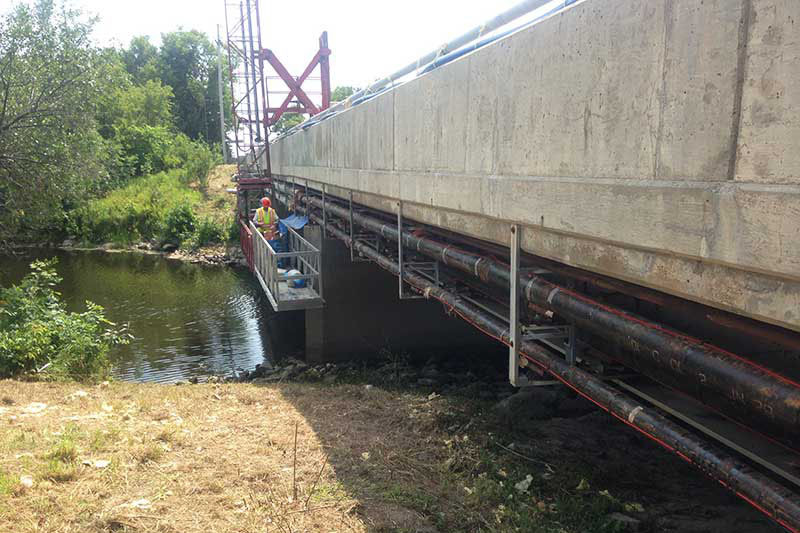 We have completed various bridge rehabilitation projects which include jacking and leveling, re-seating, abutment rehabilitation, re-decking, wing walls repairs and railing work. There are many reasons why water could be penetrating your foundation and flooding your basement. Rest assured that we will find the root cause and rectify your problem. Our service consists of excavate the perimeter of your foundation, inspect for visual damages and gather information to determine the cause of your leaky basement. We have the equipment and experience to flush your pipes, repair foundations, waterproof the foundation, install weeping tiles, sump pits and pumps. As landscaping professionals, we’ll leave your property as good as new. We utilize a brusher head attachment at the end of our long stick excavator to clean up properties for appeal and better use of land. The extra reach of the long stick makes it ideal for harder to reach places and faster completion time as the excavator spends less time moving around and more time brushing. Our brusher head is powerful and capable of brushing down trees up to 150mm in diameter. A septic system is one of the first steps in planning when building a home without sewer services. It must be sized according to your home design and soil types of your property. We can help you by conducting a site audit and reviewing your home plan in order to create a septic design that suits your needs and meets code. We are licensed and have experience in designing and installing various types of tertiary systems. We have a large fleet of various sized plows, pick-ups, sanders, loaders and dump trucks for residential and commercial snow removal and ice control. We offer seasonal contracts and plow anytime there is 5cm or more of snow so you never have to worry about shoveling snow again!